The growth of the plant toward a light source is called phototropism. The growth is attributed to plant hormones called auxins. Though it appears that a plant is leaning toward the light source, it is actually growing toward the light source. I have several potted plants sitting on a table in my living room. The table is pushed up against a south facing window AND has a lamp with “grow bulbs” installed, shining 24/7. I know, that’s abusive, not allowing the little critters to sleep at all. I just keep forgetting to turn the stupid lamp off. What’s interesting about this? The plants have 24/7 artificial light shining directly down on them. However, they choose to grow toward the window. 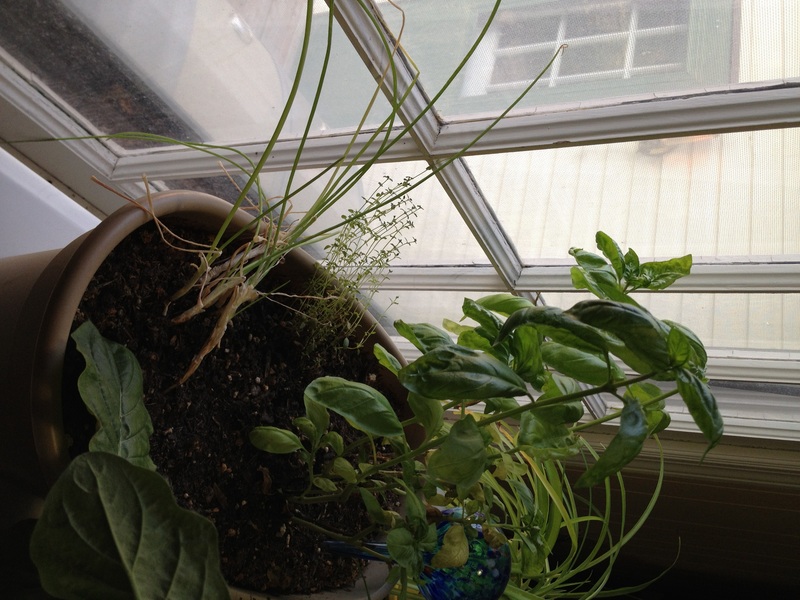 These green onions look like they’re actually trying to grow THROUGH the window. . they are so wanting the sun to shine on them. Do I strain to absorb my true light? With all the artificial light beaming down on me, am I able to tell the difference? Do I lean and try to push my way through “the window” to have the Son’s face shine on me each day? It’s the only way to stay alive. . to not die. .from the inside out. I’d like to think I do. . but, sometimes, it’s really easy to say, “this light will do. . it’s enough to help me stay nourished and grow a little.” But it’s NOT the TRUE LIGHT that IS our life, that is our breath and our being. I might listen to Christian Music and determine that I hear enough of God’s word in that way. I don’t really need to read or study His Word for myself. I’m singing along, quoting scripture all day long. I may attend church, but don’t bring the message home with me. I don’t always let it soak in and be a part of my day-to-day life. Certainly, I shake hands, hug necks and tousle little heads of hair. . but is that carrying the light into my life? I hang out with other Christians. Surely, as we speak about our lives, we’re sharing truths about our mutual Savior and His plan for us. I help the needy. . .I care for the sick. . .I deliver meals to the homebound. All of these are great things to be doing. But, they are not HOW we grow. These are things we do because we have received nourishment and shown growth. These are the pretty petals, the fragrant buds, the bright green-dancing leaves. These show that we HAVE life, but they are not how we GATHER life. Lord, help me, each day, to press toward the window of your Word that I may see your face. Let me gently sway in the breeze of your breath. Let me listen for the sound of your voice in the wind. Let me grow in you. . .show myself to be a faithful servant, lovely and fragrant in your presence. Amen.